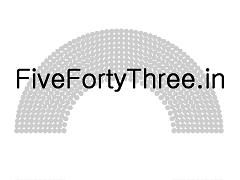 FiveFortyThree: What do the state elections tell us about the Lok Sabha Elections? What do the state elections tell us about the Lok Sabha Elections? Did the state assembly elections indicate any Modi or even AAP effect? Within Delhi, Congress suffered a 15% drop in its vote share. Interesting, the BJP also lost in its vote share by 3%. The AAP, choosing to debut in Delhi, gained 30% of the vote share. Rajasthan, which regularly swings between Congress and BJP, followed a similar pattern. The BJP gained 12% in voter share, while Congress dropped 3%. In Madhya Pradesh, both the BJP and Congress gained in voter share, by 8% and 4%, respectively. It does not seem that the BJPs gain was at the expense of Congress. In Chhattisgarh, both the BJP and Congress gained in voter share, both by 2% each. In Mizoram, where Congress retained power and gained a seat, the party saw a similar voter share to 2008. To note, one district will be repolling on 12Dec2013. It seems that the smaller players were the ones who decreased their voter share in the states. It may be that the voters are moving towards a two party preference, as the regional parties seemed to have suffered more. However, the regional parties in West Bengal, Odisha, Bihar, UP, Tamil Nadu, Kerala and Maharashtra are much stronger and these state elections are no indication for what will occur there during the Lok Sabha elections. While there is some evidence of a Modi effect in Rajasthan and Madhya Pradesh, it does not seem significant considering the voter increase that Congress also experienced in MP. Finally, with the AAP having had a strong showing and hinting at contesting more seats in the upcoming Lok Sabha election, it will be interesting to see how the voter share is affected. Will voter opinion change now that the AAP will likely be in opposition in Delhi for five months until the Lok Sabha elections?